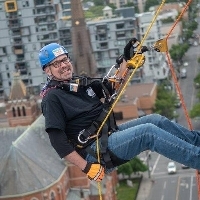 This year I am gathering my courage and participating in Make-A-Wish® Rope for Hope, rappelling down from great heights, to help grant the wishes of children living with life-threatening medical conditions. A wish come true helps children feel stronger, more energetic, more willing and able to battle their life-threatening medical condition. For many of them, it marks a turning point in their fight against their illnesses.